Verity Lambert, from Thames Television, London, says it is difficult these days to find a good and original idea for a television series. As controller of drama since 1974, and now the chief executive of Euston Films—also owned by Thames — she has to inspect and often reject scripts which lack originallity. Miss Lambert is an attractive, vital young woman with a quick sense of humour. She is in Sydney to deliver the 1979 Thames Lecture at the Australian Film and Television School studios, North Ryde, at 6.30 tonight. Her address, Concepts and Trends of Television Drama. is drawn from her first two years with Thames. "True original ideas are rare," she said. "There are no new story lines for action-adventure series for example. We have seen and heard them all 1,700 times before. "What often gives them a fresh approach is a strong leading character, or two leading characters with an interesting relationship. "Someone once said, I think it was Shakespeare, 'There are only six plots in the world'." She agreed they had been done to death. "I try with ideas and I try to be constructive. I tell them why we don't like their scripts and offer suggestions as. to how they can be improved." Verity Lambert, who is married to a television director, Colin Bucksey, began her working life as a "shorthand typist-secretary to a secretary" for British ABC Television in 1961, moving later to the drama department as a production assistant. From there she went to BBC-TV as a producer and began the popular Dr Who series, an idea which she still considers original. At Thames, Verity Lambert has developed series such as Rock Follies. Rumpole of the Bailey, Edward and Mrs Simpson and the award-winning play The Naked Civil Servant. Verity Lambert is impressed with the Australian film industry: "In England we feel there is something really exciting happening here." Australian television series, however, hardly appear in prime time in England. Power Without Glory was shown late at night and The Sullivan was aired during the afternoon. Verity Lambert will be in Sydney until Thursday. She then goes to New Zealand. 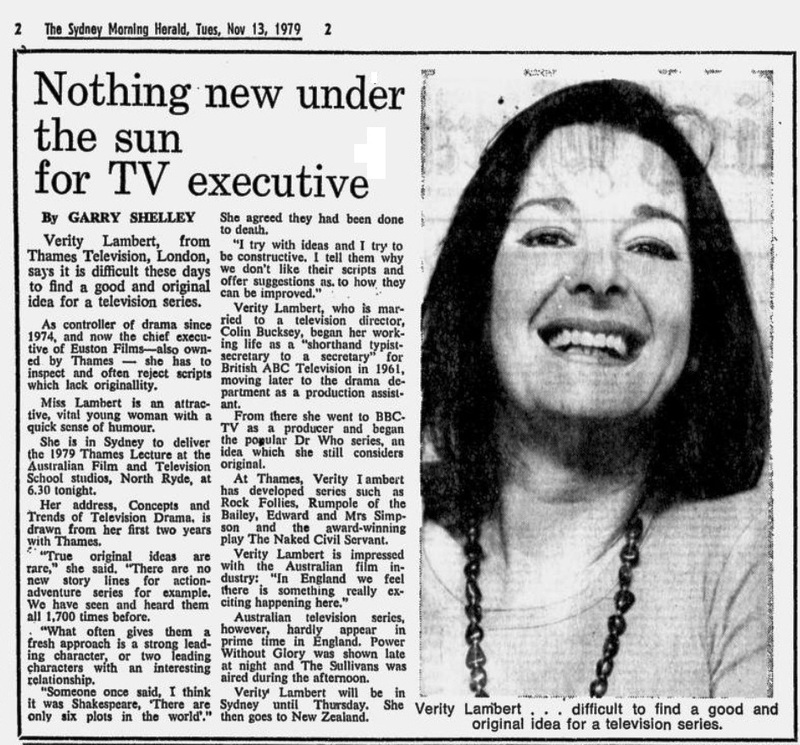 Caption: Verity Lambert ... difficult to find a good and original idea for a television series. APA 6th ed. : Shelley, Garry (1979-11-12). Nothing new under the sun for TV executive. The Sydney Morning Herald p. 2. MLA 7th ed. : Shelley, Garry. "Nothing new under the sun for TV executive." The Sydney Morning Herald [add city] 1979-11-12, 2. Print. Turabian: Shelley, Garry. "Nothing new under the sun for TV executive." The Sydney Morning Herald, 1979-11-12, section, 2 edition. This page was last modified on 12 November 2016, at 13:53.